Convert your visionary Local Service Marketplace Business into reality with the Best Thumbtack Clone in the industry. Click2Done is uniquely coded and feature-rich service marketplace platform lets you build your own local service marketplace similar to Thumbtack to connect great local professionals to the customers interested in their services. This Thumbtack Clone script lets you extend numerous services to consumers from electricians through to language teachers, DJs and personal trainers. To empower start-ups, entrepreneurs, and business organizations with kick- starting their own service marketplace business, we have built a dominant Service Marketplace script. Our ready-to-launch Thumbtack Clone comprises of all essential features you need to kick-start a successful Marketplace Website. How does Click2Done Work ? 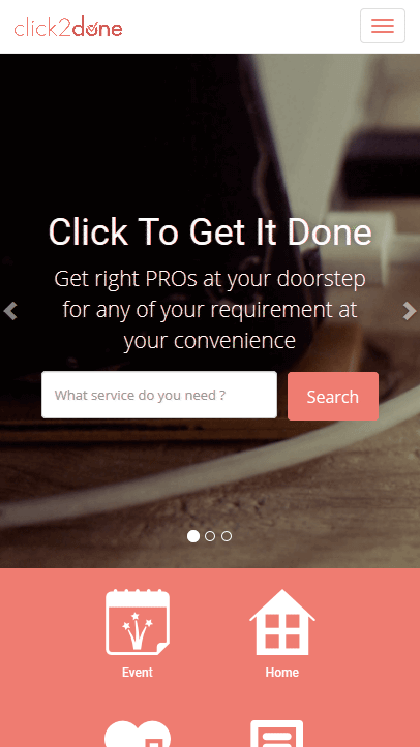 Click2Done lets you ponder wide range of services like handyman, home cleaning, guitar learning, etc. listed over wide categories like personal training, catering, moving, interior painting, and singing lessons and many more. A customer can explore service categories, then post a request for service, to which a Pro shall place quotes as per their convenience. Once the service is completed by the Pro, the payment process is undertaken in offline mode itself. Later, both the customer and the pro can place their reviews about the service done. Click2Done is a ready-made service marketplace script that is built in our very own strapping framework of current technologies like PHP and MySql. Being an open-source languages, these technologies makes our service booking script highly robust and scalable to implement any customization. Additionally, there are various other technologies like Ajax, HTML5 CSS, etc that fortify the script to let you offer high user-end experience. Admin is lent a hand by highly managed admin panel through which he will be able to manage user & sub admins, major outlines & statistics, export users and payment details with CSV and XLS and many more. Customers are the users who post service requests on the website. They will have a user friendly dashboard through which they can post unlimited service requests, accept/reject quotes of PRO, leave a review and many more. PROs are the service providers placing quotes on service requests through their user friendly dashboard. They are also accommodated with wallet, portfolio, credit package plans and many more. How Thumbtack Clone helps you get started with Local Service Booking website? To get started with a service booking website, all you need is our innovative service marketplace script - Click2Done, which is our predominant ready-to- launch local service booking website to meet your Thumbtack Clone requirements. Click2Done comes bundled with all the basic features required for any service marketplace platform. Moreover, Click2Done lets you render be customized as per the features and niche services you want to render in a specific industry. With Custom Thumbtack Clone, we walk an extra mile to give your Service Marketplace Business an extra edge. Why Custom Thumbtack Clone for your marketplace software requirements? As the thinking and behavior of next gen consumers are changing remarkably, we at MintTM have drawn the idea of customized service marketplace script. We have built a basic service marketplace software that let you implement ‘X’ number of custom features to meet your niche service marketplace platform requirements. We always foster you by implementing custom features that you want in our ready-to- use service marketplace script. How to make money with your Service Marketplace platform? Click2Done pursues commission based revenue model where the transactions are generated by monetizing the professionals, merchants or service providers for offering them with earning opportunities and grow their businesses. Admin will earn revenues from credit package plans that are purchased by PRO (service providers). Credits are essential to place a quote on the service. Paid advertisement is the another opportunity for the admin to earn money over his platform by placing the ads and visuals of differing business and driving more traffic towards the website. The Standard version of Click2Done supports multi-domain license, provided that the domain name is same. For instance, on your purchase for Click2Done.com, you get multi-domain support for Click2Done.uk, Click2Done.au, Click2Done.in, provided they have same client ownership. Can I customize the Click2Done ? Can I claim complete ownership of the Click2Done ? How will I receive Click2Done after purchase ? We do not provide any direct links for downloading Click2Done. However, upon purchase of Click2Done, our support team will get in touch with you to know your preference as to either deploy and configure the script on your server OR send you the link to download the source code of script. Can I use Click2Done for commercial purpose? Legal: Use of the term Thumbtack Clone is for general information purpose to give a better idea about our script as it is a standard practice of referring a script similar to the popular website with identical business model. The script is inspired by the best & well-known existing online business model and, not the exact copy. We do not promote or engage our services/products in any means with Thumbtack. Our script is designed/developed from scratch by our own development team and is a proprietary product of MintTM. No design or development elements have been taken from Thumbtack. There will be obvious differences between a multi-billion dollar website and a clone script worth a few hundred dollars, however our clone script comprises of robust and high-end features and we always try our best to bridge the gap.